Cecil King, RI RBA ROI RSMA (1881-1942). Watercolour/gouache signed Cecil King (LR). 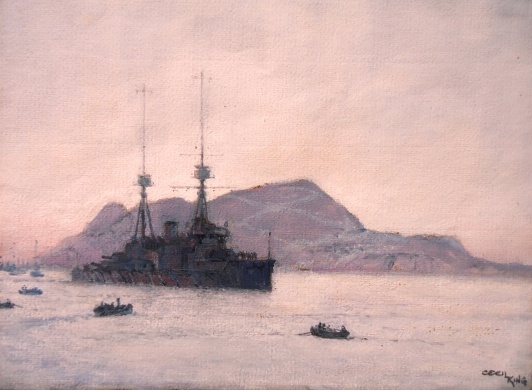 This watercolour painted by Cecil King must be one of the very first portraits of the brand new battleship HMS NEPTUNE. The year is 1911. Although he has not dated his painting its not hard to deduce that it must be between late January 1911 and mid 1912 for the ship first commissioned in Portsmouth on 11 January 1911 under Captain Charles de Bartolome, sailing some 10 days later for trials in the Mediterranean. She returned to the Home Fleet in March 1911 to become flagship of the Commander-in-Chief Home Fleet, Admiral Sir Francis Bridgeman KCB KCVO, and she remained with his flag until mid 1912 when she entered Portsmouth dockyard for post trials modifications. Significantly for us the dockyard raised her forward funnel by 10 feet - to try and obviate the usual problem of the bridge being smoked out - but this painting shows her with equal height funnels so must pre-date that Portsmouth docking. It therefore seems certain that we are looking at NEPTUNE leaving HM Naval Base Gibraltar sometime in the period late January - mid March 1911. Further proof that this portrait is of that 2 month period is that Cecil King, who knew his naval protocol and his flags, has not painted an admiral's flag on the ship: she didn't hoist that until she had returned to UK waters in March 1911.